An entertaining western of the old school (which might later have served as the plot for an hour-long episode of any of television’s most popular western series), Maury Dexter’s The Purple Hills casts its two leading men from the ranks of former studio contract players, adds a leading lady just coming to prominence in films, and sets its story amid some beautiful countryside enhanced by Cinemascope and DeLuxe color. Run Time: 1 Hr. 1 Min. An entertaining western of the old school (which might later have served as the plot for an hour-long episode of any of television’s most popular western series), Maury Dexter’s The Purple Hills casts its two leading men from the ranks of former studio contract players, adds a leading lady just coming to prominence in films, and sets its story amid some beautiful countryside enhanced by Cinemascope and DeLuxe color. It’s only an hour long, likely destined for the bottom half of double bills in the old days, but there is an intriguing premise to the story and a handful of decent characters here even if the brief running time doesn’t allow the script to develop complexities which would have lifted the film out of its otherwise prosaic results. Having lost his farm after the Civil War, Gil Shepard (Gene Nelson) decides to search for wanted criminal A.J. Beaumont (Jack Carr) to collect the $8,000 bounty for his capture and thus have something to start life anew. When he catches up to him, Beaumont tries to fight his way out of being taken and winds up dead with two of Shepard’s rifle shots in him. Shepard tries to take the body back to town, but his horse goes lame, and he has to shoot it and bury Shepard taking only his gun belt back as proof of capture for the reward. When criminal Johnny Barnes (Kent Taylor) sees what has gone down, he digs up the body, takes Beaumont’s silver belt buckle and goes into town before Shepard can get there claiming the bounty for himself. Deputy Marshal (Russ Bender) can’t decide who gets the bounty with two claimants, so he intends to take both men out to the grave to see if there are rifle bullets or gun bullets in the body. Before they can leave, Beaumont’s younger brother Martin (Jerry Summers) and his guardian Amy Carter (Joanna Barnes) arrive to identify the remains and decide to go with the deputy and the two claimants to the gravesite with Martin secretly intending to kill whichever man had killed his brother. It’s an absorbing dilemma that writers Russ Bender (who co-stars as the deputy) and Edith Cash Pearl have created for these characters: a he said-he said controversy without the ballistics or forensics of today to help easily answer the question. And the situation becomes more complex because the dead man was friends with the Apaches on whose land his body now rests, and to get to the body to examine for proof of the kill, the main characters must deal with Indians who dislike trespassers, especially one of whom has murdered a man they considered a friend to them. With that threat plus the explosive younger brother out for revenge, the movie’s final half hour is a time bomb with a very short fuse ready to explode at any given moment. Director Maury Dexter does a nice job filming the beautiful vistas suggested by the film’s title (though a day for night sequence near the climax is one of the worst ever done with the sun clearly shining brightly and the sky a clear blue) and in sustaining tension with the hair-trigger tempers of all of the men under the deputy’s charge, but even Dexter can’t save the climactic shootout with the Apaches with Gil Shepard having a seemingly endless supply of rifle ammunition or do anything to make the arbitrary decisions made at the end of the movie concerning the people who are left standing make any kind of a plausible conclusion. Gene Nelson enjoys top billing for one of the few times in his career in this film, and he earns it with an earnest performance that displays both his grit and determination but also his character’s innate goodness. He also seems to be doing most of his own stunt work in the fighting on the streets and in the river during the many confrontations he has with Kent Taylor’s deceitful, despicable Johnny Barnes. Taylor is clearly using a (much younger) stunt double in those scenes, but otherwise he gives a creditable performance full of nasty dishonesty and calculating selfishness in portraying this charlatan with few redeeming qualities. Joanna Barnes pretty much walks through her rather uninteresting role as Amy Carter (she gives a much more vivid performance in The Parent Trap that same year), but Russ Bender as the deputy concerned with being scrupulously fair gives a good account of himself in the role. Jerry Summers has some spotlight moments as the hot-tempered younger brother Martin. The film’s original Cinemascope dimensions of 2.35:1 are presented for the main titles and the final “The End” credit, but otherwise we have another of those incredibly infuriating Fox pan-and-scan transfers done for television masters of forty years ago. Thus, all of the wonderful widescreen panoramas of the film as well as the director’s careful placement of actors across the frame are lost in the 4:3 blow-up and cropping of the original photography. Now, when two actors share the frame, we get about half of each one on each edge. With the optical alterations, grain is magnified while sharp focus is sacrificed. Color is a bit faded throughout (though occasionally skin tones look decent and hues can be acceptable), Additionally, there is one sequence where color seems to subtly cycle causing skin tones to go momentarily light green. There are dust specks and colored debris on occasion as well as one reel change marker in evidence near the end. The movie has been divided into chapters every ten minutes so this disc contains 7 chapters. The Dolby Digital 2.0 sound mix is decoded by Dolby Prologic into the center channel. Engineers have done a fine job reducing any age-related hiss and crackle to practically nothing while keeping the dialogue, the sound effects, and the enjoyable Richard LaSalle background score nicely balanced and without serious issue. This made-on-demand disc contains no bonus material. If Fox had delivered even a non-anamorphic widescreen presentation throughout, it would have given this entertaining little western a chance to be remembered and enjoyed for all its virtues. 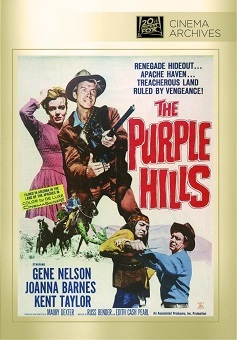 With the abominable last century pan-and-scan approach to handling Cinemascope material, however, The Purple Hills isn’t given much of a chance to distinguish itself in the minds of western fans. Sadly, this is another missed opportunity for the Fox Cinema Archive program. Pan and scan? In this day and age? Don't make me laugh. Sounds like a film I might like. When are they coming out with them FOX 21st Century PAN and SCAN tv's that are like the PAN and SCAN fans, that have a motor to move the tv back and forth, also the one I saw atTech Scan had a new never seen on this PLANETa Square screen! : On a side note the movement will keep kitty off of it,says their Tec.